The family is growing and the home is shrinking! We have a 3-bedroom condo, which seems like enough rooms for us and two kiddos, but in reality it's beginning to get a little tight around here. Before baby #2 was in the picture, Fletch's room was downstairs. As you may remember, that used to be our office until we transformed it into the awesome jungle nursery. 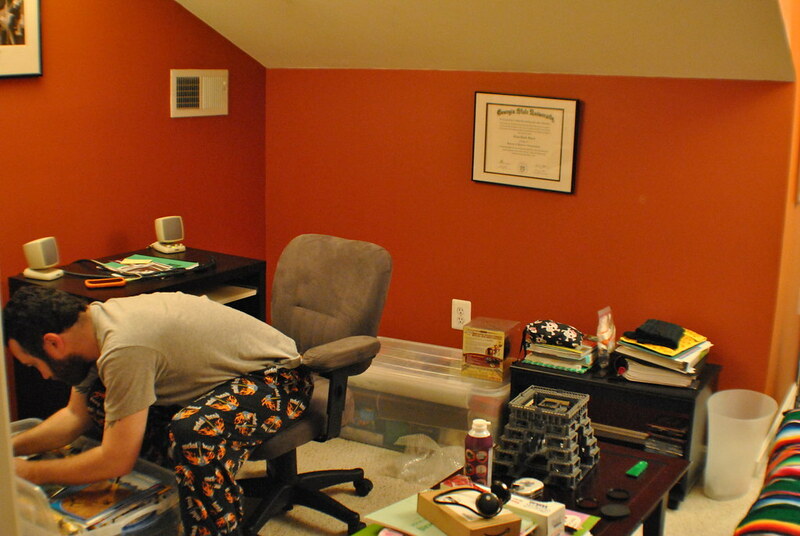 We moved the futon upstairs, along with the office. 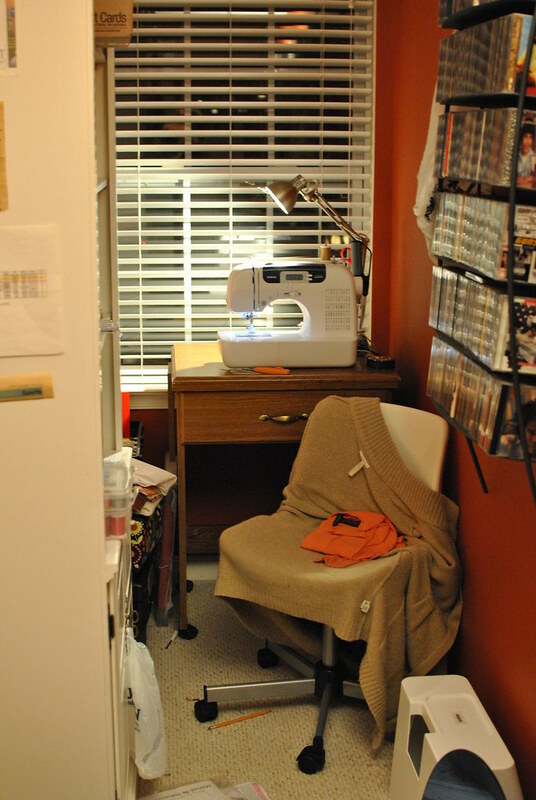 I even made myself a little sewing nook in the dormer window area. All was well with our living space. 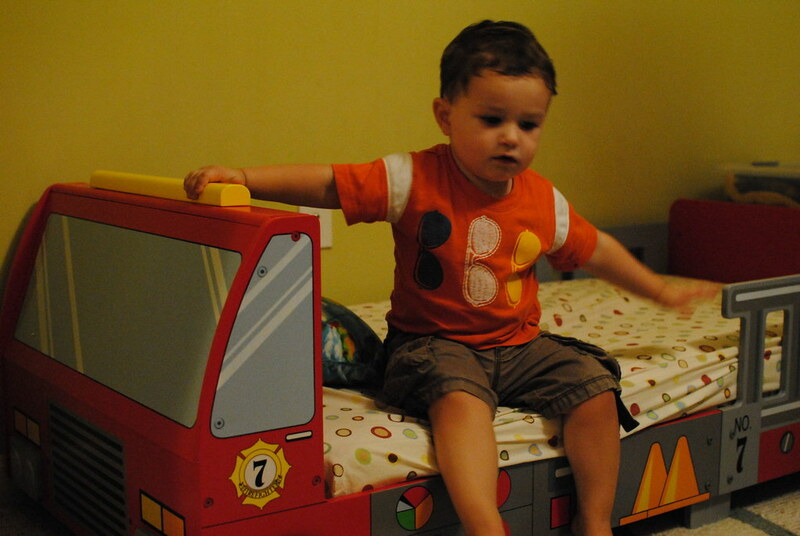 When Fletch turned 2, we disassembled the crib to make room for his awesome big boy fire truck bed. We had nowhere to put the crib, so we just put it in our bedroom up against the wall where it was out of the way. We had a plan to install some hooks in the wall of the garage and hang up the crib pieces, but then we found out baby #2 was on the way. So we just decided to keep the crib where it was since we'd be putting it back together soon enough. Oh baby#2, how you have caused such a stir! We did not know whether we wanted to keep Fletch downstairs in his room or move him upstairs. After realizing I probably will not want to go up and down stairs for diaper changes and feedings in those first few crazy sleep deprived months, we decided to move Fletch upstairs. He will have his own bathroom (perfect for the boy who is currently being potty trained), and the room is already painted orange, which will go perfectly with his fire truck bed. 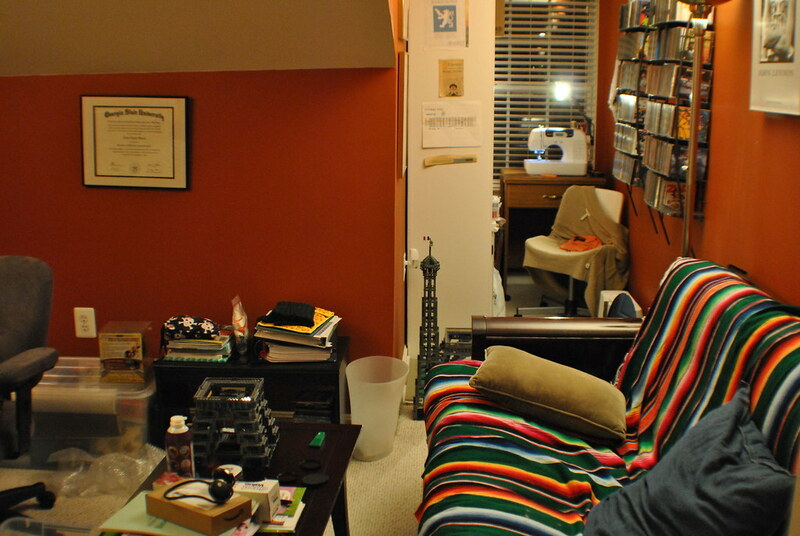 The only thing staying is the futon and a small tv stand that is going to hold Fletch's books. We figured we'd need some place to sit while we read bedtime stories and we need one last form of accommodations for guests. I have a feeling we may end up finding Fletch asleep on that thing instead of his bed, but as long as he sleeps, who cares right? Luckily, our HOA started renting out the empty rooms on the bottom floor as storage spaces. They are very convenient and actually cost a lot less than the local storage places around the corner. So that is what we are working on right now. Daddy has packed up all the LEGO sets, except for his Eiffel Tower, which needs special accommodations. Now we just wait for our storage space and start moving stuff. Have you ever been to Soundzania? Soundzania is a place that you can go…. Thats how the song goes. But Soundzania is more than a destination. It represents an imaginary world where musical instruments come alive and live and play together. In Soundzania, the instruments play music together all the time. Some children play tag or games like kickball or soccer when they get together, but when you go to Soundzania, making music is the number one game.Soundzania is a way to encourage playing with instruments, not just studying them. Instruments like play as much as children do. So, find your way to Soundzania and have some fun playing with an instrument! Soundzania was created by our friend Scott Flory back in 2006. Since then three albums, 2006's Soundzania, 2008's Soundzania on Safari and 2011's Soundzania Elementary School, have been released. Each album has it's own theme, as the titles suggest. Mandy Lynn and Ben Joe are your tour guides through the Soundzania trilogy. You can listen to some of the songs from each album on the Soundzania website, www.soundzania.com. You can buy the CDs directly from the website and the albums are also available from iTunes. I'm not a music reviewer, but I can say that the whole family will enjoy it. I encourage you to explore Soundzania! Soundzania is a loosely bound group of Dads who were at one time in rock and roll bands. Two years after band-mates Scott Flory, Ken Hougasian, and Lee Parker gave up the late nights and smoky-club lifestyle of a rock band, all three began enjoying the late nights and smelly-diaper lifestyle of fatherhood. During this time, Scott, Ken and Lee each lovingly created music to make their kids smile (or, in some cases, sleep). After rave reviews from their own children, they set out to create Soundzania. We know Scott and his family personally. We go to church and YFM activities with them. The Florys are awesome! My co-worker's wife, Angie Criswell, has her own pet photography business, Magpie Studios. She was recently featured in Fredericksburg, VA's newspaper The Free Lance-Star. If your or someone you know live near Fredericksburg and want professional pictures taken of you pets, then please contact Angie. Contact details are on the website. Out with the old and in with the new! This post highlights our past year. For more details click on the links throughout. In some ways 2011 will be a year to forget but there are definitely some positives to look back on. Lets review those first. The biggest news is that the family circus has a coming attraction. That's right, the newest member is another boy! Just like the first time, we're keeping the name to ourselves until after he's born. The second biggest accomplishment is that Jennifer finished college in December. She earned her Bachelors in Art Education from Marymount University. We are very proud of her and she's very happy to be done. Fletch celebrated his second birthday last year. We are Friends of the National Zoo (FONZ) members so he visited the zoo a lot. He also went to the RBB&B circus, National Train Day at Union Station, and Yo Gabba Gabba Live! Yo Gabba Gabba is his favorite TV show. We added two new family members last year. Aunt Lili (Atom's sister Lisa) had her first baby on December 23. Welcome to the world baby boy Max! Earlier in the year Jennifer's sister Donna got married to Craig Straily, a former high school boyfriend. They are happy and living in Oklahoma. A couple of our nephews started the next chapter of their life. Jennifer's oldest brother David's oldest son Josh started college in the fall at Texas A&M. Jennifer's brother Bubba's oldest son John Jr. joined the military. They are growing up so fast. We wish them both success in their endeavors. We didn't have an official vacation last year, but we did manage some weekend getaways. Jennifer and I spent separate weekends in March on the annual moms and dads retreats respectively. The trips were organized by our Church's Young Family Ministries (YFM). The Moms went to the Delaware shore and the Dads went to a cabin in the Shenandoah Valley. Memorial Day weekend we went down to the Chesapeake Bay to visit friends during which Mom and Dad had a romantic night away to Smithfield Station. We attended the annual YFM family weekend retreat at Shrine Mont in June. It was a great weekend spent doing fun activities and fellowshipping with our friends. We spent Thanksgiving in New York City visiting Aunt Lili and Uncle Steven. Jennifer and I went to the Radio City Music Hall's Christmas Spectacular show featuring the high-kicking Rockettes. We also went to Macy's Santa Land. Jennifer started her own Etsy shop selling custom covers for iPads, Kindles, laptops, smartphones and the like. Opening the shop was her 2011 New Year's resolution. We got a new family truckster. As for the not-so-good of 2011, the biggest was me being laid off in January and my subsequent five month unemployment stint. I finally started working again in June. We also lost our dear friend, Jeffrey Soderberg. Our friend Chris Wade lost his political campaign bid for Braddock District Supervisor by a mere 42 votes in the Democratic Primary. Jennifer lost her wedding band on the National Mall back in the spring. It was insured so it was quickly replaced, but it was still something worth mentioning. Oh, you might have heard that there was an earthquake in the DC area! It caused no deaths, but significantly damaged the National Cathedral and the Washington Monument. That's it for 2011. We're looking forward to a less dramatic 2012. It didn't start off well with my maternal grandmother passing away at the age of 93 on January 2. If you believe the Mayan calendar that 2012 is the end of the world then you better make the most of it. God Speed.